Arrived at Kunming, meet the local English-speaking tour guide and transfer to the hotel. Free time. Meals not included. Overnight stay at the hotel. After breakfast, meet the Italian-speaking tour guide and visit The Bamboo Temple 筇竹寺, Buddhist temple inhabited from a community of bonze, it was the first temple built after the insertion of Zen Buddhism in Yunnan, and the so-called Western Hills (Xi Shan) 西山, with their many temples. Lunch at a local restaurant. Dinner not included. Overnight stay at the hotel. After breakfast meeting the Italian-speaking tour guide and visit The Rock Forest 石林, famous group of karst formations, about 85Km far away from Kunming. The characteristic Flowers and Birds Market 华和鸟市场 and The Temple Yuan Tong 圆通寺, appreciated for his serenity, one of the most ancient temple of the city and also the most famous. Lunch at a local restaurant. After the visit, transfer to the train station and night train. Dinner not included. Overnight stay on train. 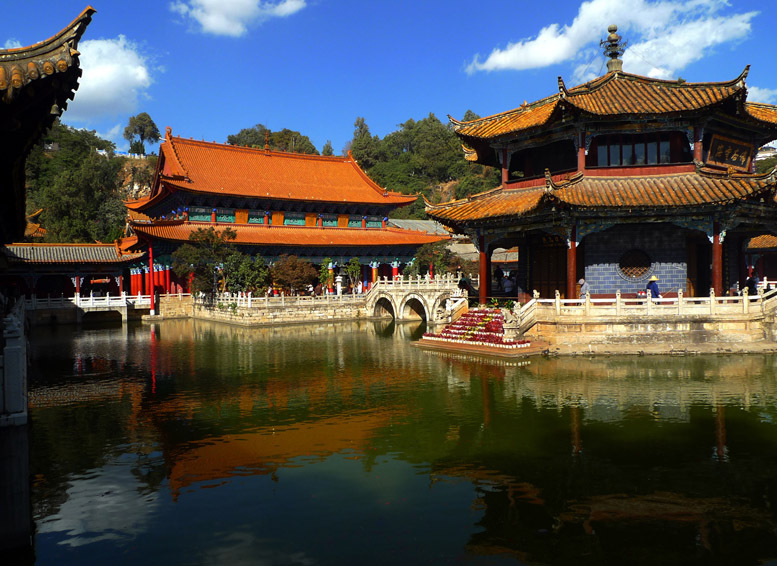 After the arrival at Guiyang, meet the English-speaking tour guide and visit of the ancient Temple Qing Yan 青岩古镇. Lunch at local restaurant. At the end of the visit transfer to Kaili. Arrived at Kaili check-in at the hotel. Dinner not included and overnight stay at the hotel. After breakfast, meet the English-speaking tour guide and visit The Kaili Ethnic Minority Museum 凯里民族博物馆, The Miao Ethnic Village Ma Tang 麻塘苗寨. Lunch at local restaurant. After lunch transfer for visiting The Miao Ethnic Village Xi Jiang 西江苗寨 the biggest village of Miao ethnic, also called “one thousand families Miao village”. Transfer to the hotel and check-in. Dinner not included and overnight stay at the hotel. After breakfast, meet the English-speaking tour guide and visit The Miao Ethnic Village Paika 排卡 村, well-know for the production of “Lusheng”, characteristic musical instruments of Miao ethnic. Lunch at local restaurant. After lunch visit The Miao Ethnic Village Da Tang 大塘苗寨. At the end of the visit transfer to Kaili. Transfer to the hotel and check-in. Overnight stay at the hotel. After breakfast, meet the English-speaking tour guide and transfer to Libo. 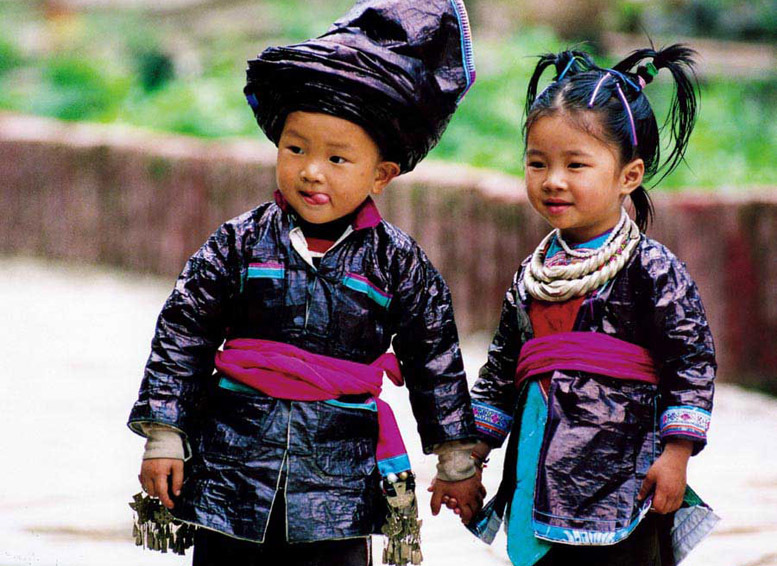 During the itinerary visit The Qing Man Village 青曼 村庄 and The Miao Ethnic Village Shi Qiao 石桥苗寨. Lunch at a local restaurant. After lunch we continue visiting The Shui Ethnic Villagei Shui Ge 水各水寨. Arriving at Libo check-in at the hotel. Dinner not included. Overnight stay at the hotel. After breakfast, meet the English-speaking tour guide and visit Xiao Qi Kong 小七孔, The Xiangshui Waterfalls 水瀑布 and The Yao Village 瑶山村庄. Lunch at a local restaurant. At the end of the visit return to Libo. Dinner not included. Overnight stay at the hotel. In winter time this excursion won’t take place due to shortage of water in the area, in place of it another excursion will be offer. After breakfast, meet the English-speaking tour guide and transfer to Rongjiang. 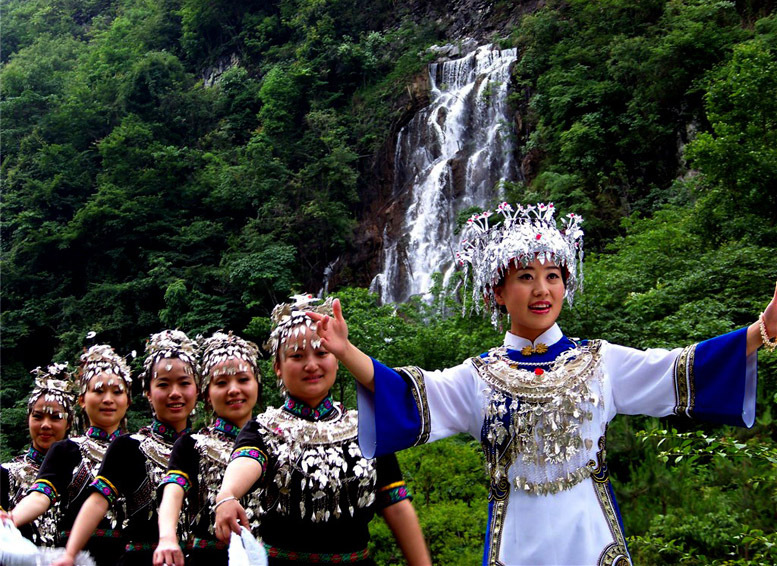 During the itinerary visit The Shui Ethnic Village 水族村庄. Lunch at local restaurant. After lunch visit The Dong Ethnic Village Che Jiang 车江侗寨. Arriving at Rongjiang check-in at the hotel. Dinner not included. Overnight stay at the hotel. After breakfast, meet the English-speaking tour guide and visit Miao Village Bainiao 百鸟苗支系. Lunch at a local restaurant. At the end of the visit return to Rongjiang. Dinner not included. Overnight stay at the hotel. After breakfast, meet the English-speaking tour guide and visit The Miao Ethnic Village Basha 岜沙村, the name means “place of one thousand kind of vegetation” is a village in the middle of the forest that for generations didn’t have any contact with the outside world. Lunch at a local restaurant. After lunch visit The Dong Ethnic Village Yin Tan 银坦侗寨. Arrived at Zhaoxing check-in at the hotel. Dinner not included. Overnight stay at the hotel. After breakfast, meet the English-speaking tour guide and visit The Dong Ethnic Village Tang An 堂安侗寨 and The Dong Ethnic Village Zhaoxing 肇兴侗寨 one of the biggest village of this ethnic in all China. Lunch at a local restaurant. Dinner not included. Overnight stay at the hotel. After breakfast transfer by car to Sanjiang, driver and tour guide English-speaking. During the itinerary visit of The Ping Bridge 地坪风雨桥. Lunch at a local restaurant. Arrived at Sanjiang meeting the Italian-speaking tour guide and check-in at the hotel. Dinner not included. Overnight stay at the hotel. After breakfast, meet the Italian-speaking tour guide and transfer to Guilin. 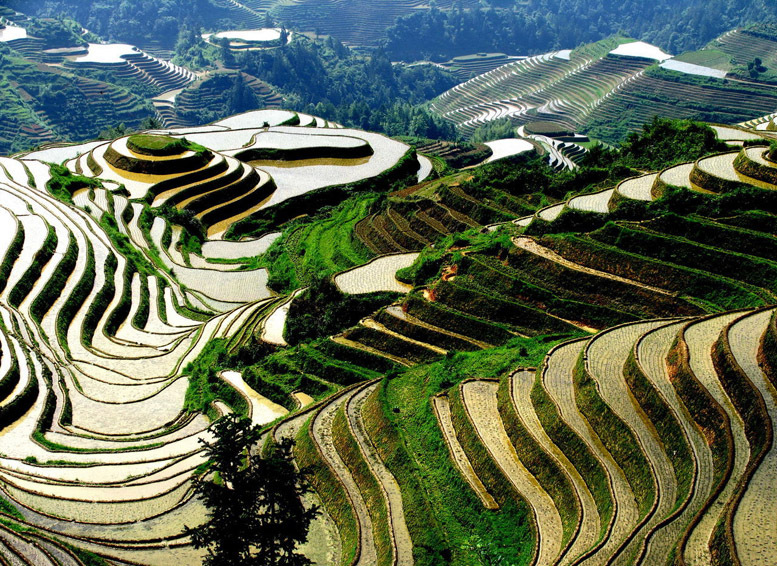 During the itinerary stop at Longsheng 龙胜 visiting The Terraced fields Longji 龙脊稻田, characterized from the rice plantations. This view is part of the top 12 of the most striking places in Guanxi province, those terrains has 600 years of history, they were built during the Yuan dynasty and completed at the beginning of the Qing dynasty. Lunch at a local restaurant. At the end of the visit transfer to Guilin. Arrived at Guilin check-in at the hotel. Dinner not included. Overnight stay at the hotel. After breakfast transfer to the dock by private car for Cruise on Li river 漓江游船从桂林到阳朔 (about 5 hours). During the cruise you can admire landscapes of amazing beauty, immortalized from full generations of painters. Lunch buffet on board. At 14:00 arrival at Yangshuo. Afternoon free for shopping. In the evening Light show on the Li River 印象刘三姐. Dinner not included. Overnight stay at the hotel. After breakfast, meet the English-speaking tour guide and visit the fisherman Village Xinping 新平村. At the end of the visit transfer to Guilin. Lunch at local restaurant. In the afternoon visit The Flute cane Cave 芦笛岩, cave used as refuge from the residents of Guilin during the Japanese invasion in 1940. Transfer to the airport and flight to Hong Kong. At the arrival at Hong Kong meet the English-speaking tour guide and transfer to the hotel. Dinner not included. Overnight stay at the hotel. After breakfast at the hotel, transfer to the airport and flight back to Italy. PLEASE NOTE : it is about small villages where there are no hotels. We guarantee that the accommodation that we offer in those hostels is the best for this place with private and clean bathroom.